Knightdale, NC, December 28 30, 2010 – Signed into to law last week by President Obama, the tax credits for homeowners who make qualified energy efficient retrofits to their homes has been extended. Known as the 25C Tax Credits, these tax credits are extended through 2011, but contain some differences from the previous 2009 – 2010 tax credits that homeowners should be aware of such as: a cap on the total amount of credits homeowners are eligible for, varying maximums set by product group, and changes in qualifying equipment standards. Next, all qualifying energy efficient products have a tax credit worth 10% of installed costs with restrictions set to establish maximum limits for the different product categories. Qualifying central air conditioners have a $300 maximum; gas furnaces, oil furnaces, boilers a $150 maximum; heat pumps a $300 maximum; and water heaters a $300 maximum. These individual maximum amounts are additive to a $500 maximum lifetime tax credit. And lastly, the qualifying standards for the central air conditioners, heat pumps and water heaters have not changed; however, the new law increases the qualifying standards for natural gas hot water boilers, propane hot water boilers, oil furnaces and oil hot water boilers to 95% AFUE (from 90% AFUE). The qualifying standards for natural gas furnaces and propane furnaces remain at 95% AFUE. For more information about these new tax laws and qualifying products go to: www.dsireusa.org and www.weathermasterhvac.com. 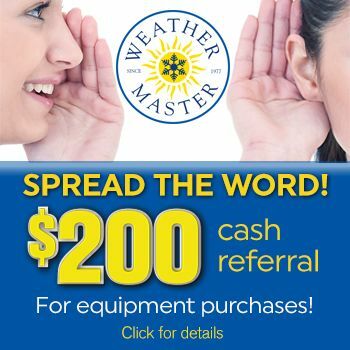 Weather Master Heating and Air has been serving Wake, Durham, Granville, Chatham and Johnston counties since 1977. By providing the very best in air conditioning, heating and plumbing equipment and service, Weather Master Heating and Air delivers world-class service with a small-company touch. They are committed to doing “Whatever It Takes” to deliver immediate comfort to North Carolinians.